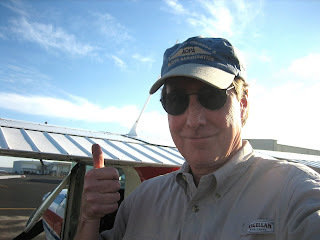 Many thanks to Mark Cartwright of Houston for taking me along flying a G1000-equipped Cessna 172. 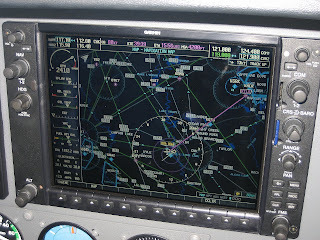 We flew from Austin Bergstrom to Killeen, TX and enjoyed the easy to read moving map display on the MFD side (co-pilot side) of the G1000 system's dual displays. The system includes a Garmin mode-S transponder which will provide traffic alerts of intruder aircraft on the moving map display. For this to work you must be under ground radar suveillance which has mode-S and TIS capability. Basically the ground radar will detect targets for you and uplink to your aircraft the TIS data (Traffic Information System). So if you are way out in the sticks you won't get TIS traffic data on your map. Most major Class-C aiports now have mode-S with TIS service. Here are a couple of photos (click to enlarge) as well as a GPS track log which I dumped from my Garmin 396......which I took along for overkill. 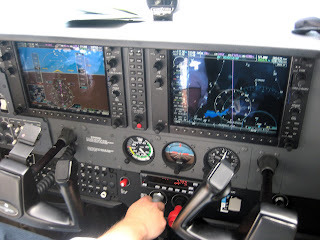 A great on-line tutoral video on the G1000 is here. More photos of our flight can be seen here. Mr. Thompson: You are Now Free to Fly About the Country! 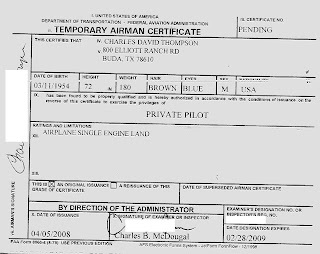 I passed my Private Pilot FAA checkride this afternoon! My final landing at KAUS was behind a B-17 Bomber from WWII. ATC's conversation went like this, "Cessna 51A you are number two for landing behind a B-17 bomber do you have the traffic in sight?" My answer was, "Cessna 51A has the big bomber in sight". Click here to listen to cockpit audio of my final approach. This particular B-17 has an interesting history that you can read about here.